Here are the best San Ignacio hotels that will fit everyone's budget and lifestyle which will help ensure for a memorable jungle vacation in Belize. Adventurers looking for luxury accommodations next to a pristine river should try the Mystic River Resort and the Lodge at Chaa Creek boasts a 400-acre nature preserve with children activities. Couples looking for luxury will enjoy the privacy at the Ka'ana Resort and the jungle landscape at Mahogany Hall Boutique Resort as well as the GumboLimbo Jungle Resort. Family-friendly properties include Crystal Paradise Resort as well as the Table Rock Jungle Lodge which is situated on the Macal River. The Cahal Pech Village Resort is ideal with walking access to Mayan Ruins and when you need to find an all-inclusive option the Windy Hill Resort is perfect. When you are looking for a family-friendly luxury San Ignacio hotel that has a surreal jungle setting and offers onsite activities for children then the Lodge at Chaa Creek is ideal. Located within a 25-minute drive to San Ignacio between the Cristo Rey and Negroman areas, the Lodge at Chaa Creek is situated on 365-acres of jungle landscape along the Macal River and is less than 3-miles to the Xunantunich Mayan Ruins. The Lodge at Chaa Creek is composed of 23 thatched roof cottages and several modern architecturally designed buildings that contain numerous suites as well as villas that are furnished with a modern Belizean decor. There is also a budget-friendly campground onsite that features 10 rustic style stand-alone casitas that have a choice of bedding and a private porch. Cottages have a choice of bedding, a sitting area and a private porch with jungle views. The Belize Orchard villa has a loft-style layout with four beds and a private garden with veranda. The Garden Jacuzzi suites have an open floorplan with a day bed and a private veranda that has a garden view. 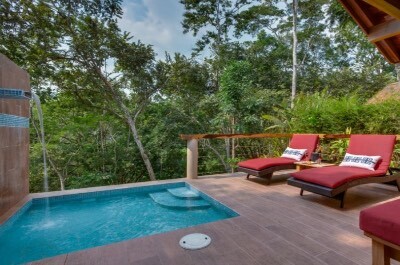 The Macal Cottage has an open floorplan with a day bed, sitting area and two private verandas that include Belize Treetop suites are one-bedroom with an open floorplan, a large living room and private wrap-around veranda. The Belize Hilltop villa has three-bedrooms, a separate glass walled living room, 2-bathrooms, full kitchen and wrap-around veranda that contains a Jacuzzi. The Belize Ix Chel villas are two-bedrooms with a large glass walled living room, private butler, private pool, Jacuzzi and a wrap-around veranda. The Lodge at Chaa Creek San Ignacio hotel is superb for adventure with horseback riding, hiking (guided/non-guided), swimming in the Macal River, the is a Natural History Center and a butterfly exhibit as well as supervised activities for children. The property is within a short drive to Cahal Pech Mayan Ruins, El Pilar Mayan Ruins and the Green Iguana Conservation Project. The Lodge at Chaa Creek has a freshwater Infinity swimming pool as well as a full service spa. Dining at the property includes a complimentary breakfast and lunch as well as dinner is served at the Chaa Creek Restaurant. Nightlife can include everything from guided jungle walks, listening to the jungle from your veranda or enjoying an evening with friends at the Chaa Creek Restaurant Lounge. When you are seeking an eco-friendly luxury San Ignacio hotel that is nestled in a serene jungle surrounding and offers all-suite accommodations then the Mystic River Resort is perfect. Located 7-miles away from San Ignacio in the Negroman area, the Mystic River Resort is situated on 180-acres of jungle landscape along the Macal River and is within 10-miles to Cahal Pech Mayan Ruins. The Mystic River Resort is composed of a number of modern one floor buildings that contain 8 all-suite accommodations which are furnished with a contemporary interior. This eco-friendly resort does not offer televisions or telephones in the suites. Studio suites are spacious with more than 500 square feet within open floorplan that includes a choice of bedding, a fireplace and balcony with views of the Macal River. One-bedroom suites have more than 700 square feet of space with a separate living room, fireplace and a large private balcony that offers views of the river. The two-bedroom suite has more 1,200 square feet with a choice of bedding, a separate living room, a fireplace and large outdoor living areas on the terrace which has river views. The Cloud 9 suite has more than 500 square feet of living area with an open floorplan that has a fireplace, sitting area as well as a large terrace which contains a private plunge and offers views of the river. The Mystic River Resort has a splendid spot on the Macal River with a nice river beach where you can relax and swim. There are complimentary canoes, boogie boards as well as inner tubes and the property contains miles of jungle hiking trails. The Mystic River San Ignacio hotel is close to many outstanding attractions such as the Belize Botanic Garden, the Actun Tunichil Muknal Cave and you are less than 9-miles to the Green Hills Butterfly Ranch as well as less than 20-miles to the El Pilar Mayan Ruins. The Mystic River Resort has a freshwater swimming pool that has a sundeck with an outdoor BBQ area and there is a full service spa onsite as well as yoga classes available. Dining onsite includes all three meals at La Ranita and you can find dining with a short drive to San Ignacio where you can eat at Ko-Ox Han nah, Serendib and Bambu Tee Belize. Nightlife includes a quiet drink listening to the river or relaxing on your terrace. If you want to find a luxury San Ignacio hotel that is close to Mayan Ruins and offers a perfect quiet atmosphere for couples then you should stay at the Ka'ana Resort. Located within 3-miles to San Ignacio along the Western Highway, the Ka'ana Resort is situated within a lush manicured garden and is a 15-minute walk to the Cahal Pech Mayan Ruins. 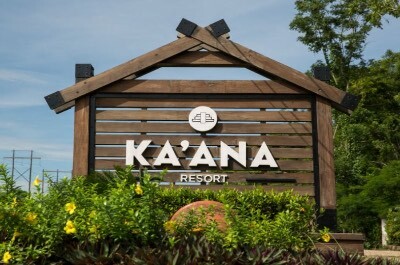 The Ka'ana Resort is composed of hacienda-style buildings and casitas that feature 17 units which are furnished with a luxurious contemporary interior. Balam suites are the smallest at 300 square feet with a queen size bed and an outdoor terrace that features garden or pool views. Casita suites boast 400 square feet with a choice of bedding and a private terrace that has garden as well as pool views. Master suites are 700 square feet with an open floorplan that contains a sofa, front and back decks with an outdoor shower as well as views of the pool. One-bedroom Private pool villas are sized at 1,250 square feet with a separate living room, private plunge pool, personal butler, outdoor showers, a garden and terrace overlooking the plunge pool. The two-bedroom Private pool villa is 2,500 square feet with a separate living room, a choice of bedding, private plunge pool, garden, outdoor showers, personal butler and large outdoor terrace spaces for living as well as dining. The Ka'ana Resort San Ignacio hotel is a superb place to begin your adventures of the area which could include trips to Xunantunich Mayan Ruins, Bol's Cave Museum, the Belize Botanic Gardens and the Tapir Mountain Nature Reserve. The property contains a freshwater swimming pool and a full service spa. Dining includes a complimentary continental breakfast in your casita, suite or villa and La Ceiba serves all three meals using produce that grown within a 2-acre private garden. There are numerous dining options offsite that include Pop's Restaurant, Running W Steakhouse and Restaurant as well as the Great Mayan Prince. Nightlife is quiet with a drink at the Wallace Bar onsite and the property contains a 1,000 bottle wine cellar. When you are looking for a secluded mid-range San Ignacio hotel that is eco-friendly and offers plenty of onsite activities then you should try the Table Rock Jungle Lodge. Located 3-miles south of San Ignacio within the Cristo Rey area, the Table Rock Jungle Lodge is situated on 105-acres along the Macal River and is 7-miles away from Cahal Pech Mayan Ruins. The Table Rock Jungle Lodge is composed of a series of rustic one story buildings with thatched roofs which contain 8 cabanas that boast a contemporary Mayan interior. There are no televisions or telephones within the cabanas and high wattage electrical items are prohibited. Garden view cabanas offer 322 square feet with a double bed and a shared veranda in a duplex style building. Jungle view cabanas have 570 square feet with a choice of bedding, an open floorplan that includes a sitting area and a private veranda. Rain Valley view cabanas are sized at 645 square feet with an open floorplan that includes a futon, a choice of bedding and veranda that overlooks the Macal River. The two-bedroom Rainforest cabin is 828 square feet with bunk beds in the second bedroom, a separate living room, 1.5-bathrooms and a private veranda. The Shamrock Bluff house is situated on a 15-acre mini estate and is a two-story house that features three-bedrooms, 2.5-bathrooms, a kitchen, living room and a wrap-around veranda with views of the river valley. The Table Rock Jungle Lodge is a short distance from the Barton Creek Caves, 7-miles away from the Cahal Pech Mayan Ruins and 17-miles from El Pilar Mayan Ruins. The Table Rock Jungle Lodge San Ignacio hotel boasts plenty of onsite activities with a swimming beach on the Macal River, a navigable hiking trail system and there is complimentary use of canoes as well as inner tubes to play on the Macal River. 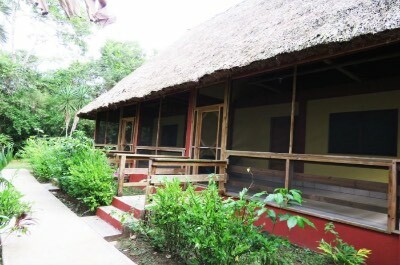 Also on the property is a working farm, hammock palapas and massages are available. Dining includes an onsite restaurant that serves all three meals from ingredients that are produced on the farm. Offsite dining requires a drive to San Ignacio where you can find Cenaida's, Erva's and Hode's Place Bar and Grill. 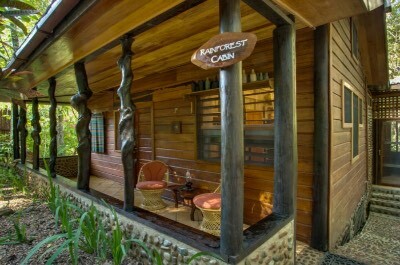 Nightlife is quiet with a drink around a fire or while listening to the jungle from your veranda. If you are interested in a mid-range San Ignacio hotel that offers easy access to Mayan Ruins and is perfect for all adventurers including families then the Cahal Pech Village Resort is superb. Located in San Ignacio, the Cahal Pech Village Resort is situated within a lush manicured landscape adjacent to the Cahal Pech Mayan Ruins and is less than 0.5-miles from the Green Iguana Conservation Project. The Cahal Pech Village Resort is composed of 51 rooms and cabanas in a modern three floor architecturally styled building with Colonial accents as well as numerous rustic cabanas which feature a distinct Belizean Mayan decor. Each room and cabana offers a private balcony or patio which features views of the surrounding area including the Cahal Pech Mayan Ruins. Standard rooms are 172 square feet with a double bed and standard cabanas have 301 square feet as well as a small sitting area with a couch. Deluxe and Family cabanas are more spacious with a choice of bedding and offer better views of the area. One-bedroom junior suites offer a choice of bedding and a separate living room. Two-bedroom suites are the largest on the property with features such as a choice of bedding, a separate living room and some have large private verandas. 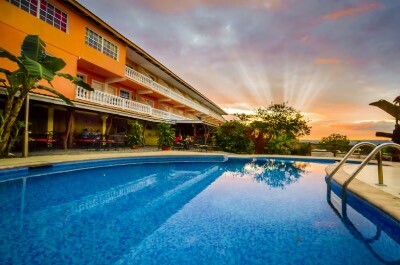 The Cahal Pech Village Resort San Ignacio hotel is a perfect spot to start your adventures and can help arrange numerous tours within the area. The Cahal Pech Village Resort is within an easy drive to many attractions which include the Mopan River, the El Pilar Mayan Ruins, Bol's Cave Museum as well as Barton Creek Cave and you can walk to the San Ignacio Market. 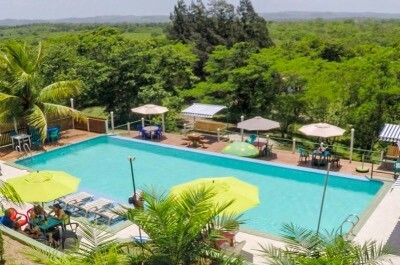 The Cahal Pech Village Resort has a freshwater swimming pool with a nice terrace that overlooks the valley and there is a full service spa onsite. Dining at the resort includes Ix'tabai Restaurant that serves all three meals and you can easily walk to several restaurants offsite that include Yoli's Pizza, Jalapenos Restaurant and Bar as well as Guava Limb Cafe. Nightlife includes a nice drink on the terrace, a glass of wine at the Wine House or you can try the Smokey Garden. When you are searching for a mid-range San Ignacio hotel that offers an all-inclusive package with resort style amenities and is superb for families as well as close to several Mayan Ruins, then the Windy Hill Resort is perfect. 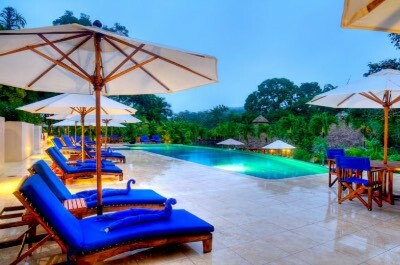 Located less than 1.5-miles away from San Ignacio along the Western Highway, the Windy Hill Resort is situated on 100-acres of pristine jungle landscape and is less than 1-mile away from the Cahal Pech Mayan Ruins. The Windy Hill Resort has a modern one story architectural design that houses 10 rooms and 13 cottages that feature a bright contemporary interior. Standard rooms are spacious with a double and twin size bed as well as views of the gardens from picture windows. Deluxe cottages have 2 double beds, a sitting area and private porch with views of the gardens. The Windy Hill Resort is ideal for adventurers with easy drive times to nearby attractions such as 3-miles to Xunantunich Maya Ruins as well as the Belize Botanic Gardens and you are less than 5-miles away from Actun Chapat Cave. All-inclusive packages include several specific tours that are arranged by Windy Hill Resort and each package varies on the number as well as location of the tours. The Windy Hill Resort boasts onsite hiking and nature trails as well as horseback riding. 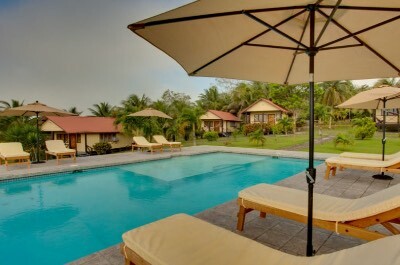 The Windy Hill Resort San Ignacio hotel has numerous resort style amenities including a freshwater swimming pool with a beautiful sundeck, a fitness center, a recreation area and massages are available. All-inclusive dining for all three meals can be found at the Black Orchid Restaurant but beverages are not included. Offsite dining options are short drive to San Ignacio where you will find Pop's Restaurant, Ko-Ox Han nah and the Crave. Nightlife includes drinks at the bar, listening to the jungle sounds, a guided evening nature hike or you can visit Hode's Place Bar and Grill as well as the Great Mayan Prince in San Ignacio for cold libations. When you are interested in a boutique luxury San Ignacio hotel that has a quiet atmosphere and is perfect for all adventurers especially couples then you should stay at the Mahogany Hall Boutique Resort. Located 4.5-miles northwest of San Ignacio in the Bullet Trees Falls area, the Mahogany Hall Boutique Resort is situated along the Mopan River and is a 20-minute drive to the Cahal Pech Mayan Ruins. The Mahogany Hall Boutique Resort has a French Colonial two floor architectural style with 8 rooms and suites that sport a colonial decor. Deluxe rooms have varying floorplans as well as unique interior features with a choice of bedding and large picture windows that feature jungle or river views. Suites are larger with a choice of bedding, sitting area, upgraded amenities and a private balcony that has views of the river. 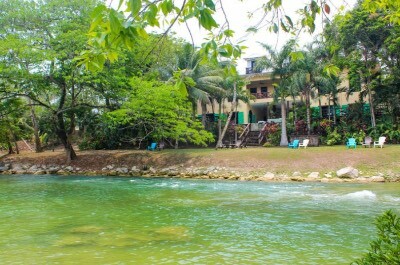 The Mahogany Hall Boutique Resort allows for easy access to the Mopan River where you swim, tube and boogie board as well as river volleyball when the river is low. The property is within an easy driving distance to many stellar attractions such as less than 10-miles to El Pilar as well as Xunantunich Mayan Ruins and you are less than 5-miles to the Green Iguana Conservation Project. There are numerous opportunities for hiking and birdwatching at the property. The Mahogany Hall Boutique Resort San Ignacio hotel has a freshwater Infinity swimming pool surrounded by a gorgeous verandah and there is a full service spa onsite. Dining includes Rico's Restaurant and Bar which serves all three meals. Offsite dining is a short drive to San Ignacio where you will find the Running W Steakhouse and Restaurant, Eva's Restaurant and Bar as well as Serendib prepares Indian dishes. Nightlife can be a quiet drink while listening to the river and jungle sounds or you can take a short drive to Coze Grill where you can listen to live music. If you are looking for a mid-range San Ignacio hotel that offers easy access to several Mayan ruin sites and is perfect for families then you should try the Rumors Resort. Located 3-miles southwest of San Ignacio along the Western Highway, the Rumors Resort is situated within a lush jungle setting and is within a 10-minute drive to Xunantunich Mayan Ruins. The Rumors Resort is composed of several unique modern two story architecturally designed buildings that contain 15 rooms and suites that boast a contemporary interior. Economy rooms have a variety of bedding choices and some units offer a balcony or terrace that features a jungle or garden view. Standard rooms are larger with a choice of bedding, sitting area and some offer balconies with jungle/resort views. Deluxe rooms have varying floorplans with a choice of bedding, a sitting area, a small kitchenette (microwave and refrigerator) as well as a large sitting area on a terrace that boasts garden or jungle views. The Rumors Resort San Ignacio hotel is a superb place to begin your jungle adventures with numerous attractions within an easy drive which include 2-miles to Cahal Pech Mayan Ruins as well as the Green Iguana Conservation Project and 3-miles to the Belize Botanic Garden. The Rumors Resort has a freshwater swimming pool with a nice sundeck and children's area that offers a playground. Dining onsite includes the Rumors Restaurant which is open for all three meals and you are within a 3-mile drive to Pop's Restaurant, Cenaida's and the Crave. Nightlife brings karaoke, live music and entertainment in the bar area at Rumors Restaurant or you can take a short drive to the Wine House as well as the Purple Star Sports Bar and Grill. If you are seeking a secluded family-friendly San Ignacio hotel that is close to nearby Mayan ruins and is within a relaxed atmosphere then the GumboLimbo Jungle Resort is ideal. Located less than 10-miles from San Ignacio in the Georgeville area, the GumboLimbo Jungle Resort is situated within in a tropical landscape with a garden area and is 7-miles away from Cahal Pech Mayan Ruins. The GumboLimbo Jungle Resort is composed of 5 modern one floor architectural style buildings that boast a contemporary wood/tile interior. The Hexagon cabana has 301 square feet with a king size bed and offers jungle views from a private porch. Private cabanas have 432 square feet with an open floorplan that offers a choice of bedding and a private porch with jungle views. Deluxe Family cabanas are the largest with a choice of bedding, an integrated sitting area and a private porch that features mountain, jungle and pool views. The GumboLimbo Jungle Resort boasts a perfect spot to begin adventures with numerous attractions within a short drive such as 5-miles to Barton Creek Cave, 7-miles to Actun Tunichil Muknal Cave and you are 6-miles from the Tapir Mountain Nature Reserve. You will find numerous hiking trails around the property for you to explore as well as excellent birdwatching opportunities within the resort. The GumboLimbo Jungle Resort San Ignacio hotel has two freshwater swimming pools that include an exclusive children's pool with a waterfall. Dining onsite includes all three meals and there is a bar for you to enjoy an afternoon or evening libation after a perfect day of exploring the region. When you are searching for a family-friendly San Ignacio hotel that has offers great access to nature trails and is ideal for all types of adventurers then you should stay at the Crystal Paradise Resort. Located 4.5-miles from San Ignacio in the Cristo Rey area, the Crystal Paradise Resort is situated directly on the Macal River and is only 12-miles away from Xunantunich Mayan Ruins. The Crystal Paradise Resort offers 2 standard rooms as well as 15 bungalows that feature a rustic jungle design with thatched roofs and the rooms do not feature televisions or telephones. Standard rooms offer a double bed as well as bunk beds and are perfect for budget travelers. Valley and Garden view thatched cabanas offer a variety of bedding choices as well as a private porch with jungle valley or a garden views. Deluxe thatched cabanas are slightly larger with a choice of bedding options and a large porch that offers jungle views. Garden view loft style cabanas are the largest and feature four beds within the loft area and downstairs as well as a porch with garden views. The Crystal Paradise Resort San Ignacio hotel is a perfect spot for you to begin your explorations with swimming and tubing options on the Macal River available. The Crystal Paradise Resort is within a short drive to many exciting attractions that include 5.5-miles to Cahal Pech Mayan Ruins, 5-miles to the Green Iguana Conservation Project and you less than 10-miles from the Green Hills Butterfly Ranch. Families will enjoy the excellent birdwatching opportunities that exist directly on the property and there are numerous hiking trails for you to conquer. Dining at the Crystal Paradise Resort includes breakfast and dinner in your room rate and the onsite restaurant prepares all three meals daily. Offsite dining requires a drive to San Igancio where you will find the Guava Limb Cafe, Ko-Ox Han nah and Erva's. 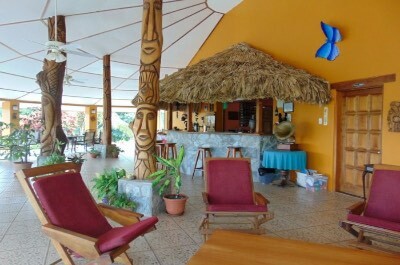 Nightlife is quiet and you can enjoy a drink at the bar or listen to jungle sounds from your porch.